I’m not really a fan of the traditional white chocolate macadamia nut cookie, (I think it’s too chalky and rich,) but I love my niece and I was willing to satisfy her craving for a white chocolate chip cookie. So, voila! A new cookie recipe was born. Regardless of the reason, the cookies were tasty! The walnuts and white chocolate complimented each other so well that it was tough to tell where the white chocolate taste began and the walnut flavor ended. And I’m excited because I’ve invented a new cookie we all love! Preheat the oven to 350 degrees. Sift together the flour, baking soda and salt. Set aside. Cream together the butter and sugars until fluffy. Add eggs one at a time until fully incorporated. Add vanilla. Add flour mixture 1 cup at a time until mixed well. Stir in chips and nuts. Drop cookies onto an ungreased cookie sheet and bake 11-13 minutes. 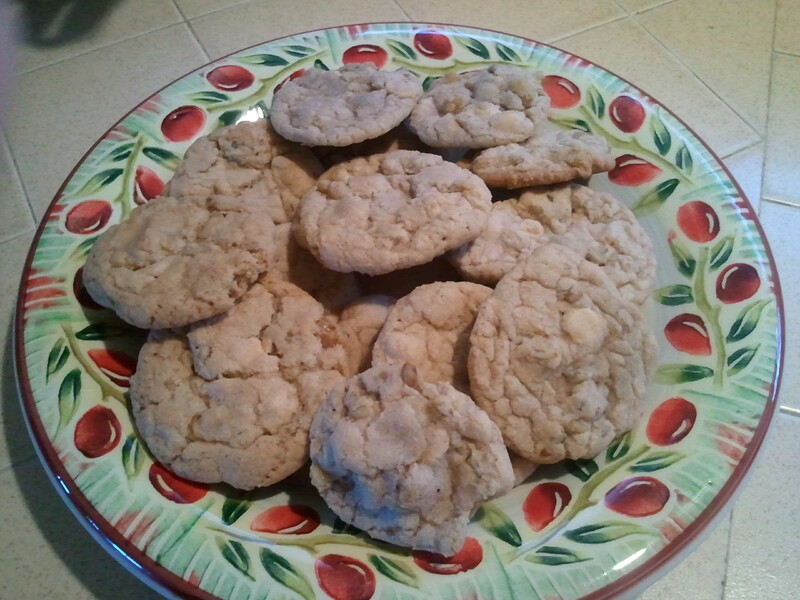 Thanks Heather I made these and they were to die for….Yum!